The serious rumblings are already out there. Undaunted by the failure of one of the most expensive presidential primary runs in history, Mitt Romney apparently wants to take another shot at getting the GOP's nomination. Utah Senator Orrin Hatch is "quite sure" Romney will run, and has said that the former Massachusetts governor "would be my preference." Sadly, there's a hoary tradition in the GOP that certain establishment-favored candidates, even though they're not the best available, have somehow earned "their turn." That belief has usually led the party straight to the presidential political graveyard, which includes the campaign corpses of John McCain (2008) and Bob Dole (1996). Following that tradition this time around would mean that the party's "it's my turn" nominees would have moved from a somewhat conservative and usually credible war hero (Dole), to an occasionally conservative and all too often not credible war hero (McCain), to a decidedly not conservative and not credible guy who didn't serve (Romney). There's a reason why the GOP is often called the Stupid Party. [BYU prof John] Gee cited examples of counter-cult activity by the John McCain and Mike Huckabee campaigns. These politicians would slip false information about Mormons into a casual message. ... "[The media] need to know some of these things that have been going on that haven't been covered, the way the coded language and off-hand remarks can be inserted in," Gee said. ... "Mitt Romney will not be able to overcome half a century of hate and bigotry, but I would love to be proven wrong," he said. "The media has to get the story correct, and it's too much to ask for." Cry me a river. As far as I know, and I followed the GOP primaries very closely, the only evidence that anyone attempted to use Mitt Romney's religion against him was one alleged early-December 2007 push poll in Iowa. Oddly enough, the only people who came forward to claim they had received the offensive phone calls were Romney campaign operatives, who "somehow" forgot to tell the press that they were on the candidate's payroll. This is relatively unexpected. Romney's Mormon faith, though ever-present, has not been as big an issue as could have been expected earlier in the year. Questions still linger as to whether the most recent Mormon "controversy" (the push polls) actually reflected any real concerted anti-Romney strategy. 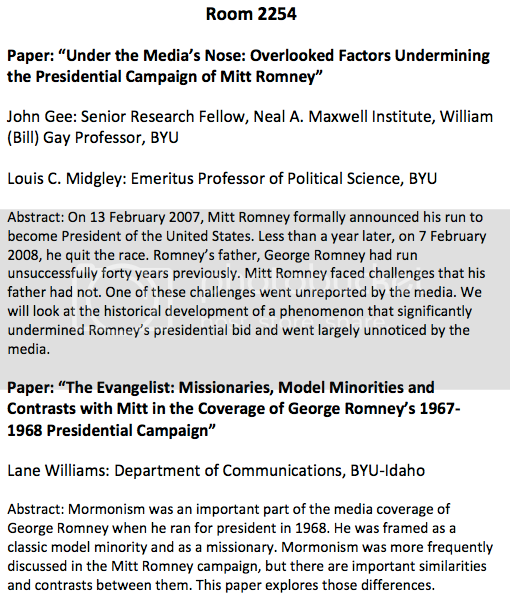 Apparently Professor Gee won't let the lack of real evidence of a "concerted anti-Romney strategy" based on Mormonism get in the way of a historically revisionist fable.